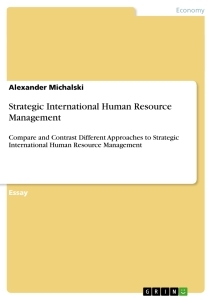 Human resource division is an essential part of any organization. The officials working in this section are called human resource managers. The responsibilities of these managers are planning, recruiting, selection, induction, training, developing, ensuring safety, determining compensation packages and smoothing career path of personals working in the organization. Human resource managers in education organization also perform these common jobs. Apart of these, there are other human resource managers in education. The core job of other human resource managers in education is unique and very different than other organization. It will be more understanding if we define who these Human resource managers in education are. In education, they are principals, their deputies, head of the department, teachers, parents, guardians and so on. Their core responsibilities are to manage, nurture, educate and prepare the prospective human resources of the society. These prospective human resources are the students who will lead the country, society and family. Their innovation will take the country in its great height. Prosperity of a country is largely determined by the quality of these resources. The people who are responsible to develop these prospective human resources are the greatest persons of the country and society. Their jobs are really unique and can be graded as very important human resource managers (VIHRM) of the country. 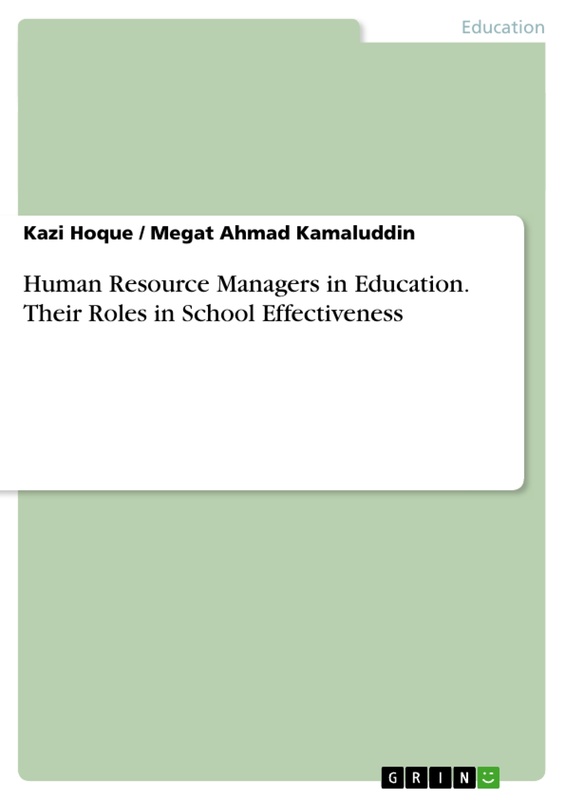 This book has focused on the impact of their roles on preparing their students ensuring effective environment of the school. Findings of some action researches have been presented in different chapters to support their roles in strengthening school effectiveness. In these chapters, the contribution of VIHRMs in education such as principals, teachers, parents will be highlighted from different empirical findings. As the development of educational system all over the world, school leaders are not only facing the pressure in reforming and sanctions, but also facing difficult contextual challenges as they work to ensure that all students achieve at levels mandated by No Child Left Behind (NCLB) requirements. In addition, principals must find teachers who are highly qualified, committed, and prepared to face the challenges of today's classrooms. The related investigation shows that, nearly 60 percent of a school’s impact on student achievement is attributable to principal and teacher effectiveness. These are the most important in-school factors driving school success, with principals accounting for 25 percent and teachers 33 percent of a school’s total impact on achievement. (http://www.nlns.org/uefjsp). Thus, the aim of this report will be clearly illustrated by what’s the significant reasons and how a successful principal plays an important role in the whole process of school’s achievement, and what kind of character should a successful principal have and so forth. The study investigated the extent of principal’s leadership management and administration as human resource managers in secondary school and the extent of effectiveness of the schools in domains of learning. Based on the findings, recommendation are made on how to improve the effectiveness of the secondary school. The following research questions guided us to finalize the report. 1. What are the essential management tasks for secondary school principals in Malaysia? 2. What school resources are principals of secondary school in Malaysia using to ensure school effectiveness? 3. Do teachers’ appraisals bring school effectiveness? The effective school is a school that can, in outcome (performance or results) terms, reflective of its learning for all mission, demonstrate the presence of equity in quality. By definition, the effective school is able to claim being effective based on student results, performance, or outcomes. Using results or outcomes as the primary basis for judging effectiveness is a significant departure from past practice. For most of their history, public schools were judged based on inputs, processes, and programs. Instructional Leadership. In the effective school, the principal acts as an instructional leader and effectively and persistently communicates the mission of the school to staff, parents, and students. In addition, the principal understands and applies the characteristics of instructional effectiveness in the management of the instructional program. Clearly, the role of the principal as the articulator of the mission of the school is crucial to the overall effectiveness of the school. Safe and Orderly Environment. In the effective school we say there is an orderly, purposeful, business-like atmosphere, which is free from the threat of physical harm. The school climate is not oppressive and is conducive to teaching and learning. Climate of High Expectations for Success. In the effective school, there is a climate of high expectations in which the staff believes and demonstrates that all students can obtain mastery of the school’s essential curriculum. They also believe that they, the staff, have the capability to help all students obtain that mastery. Quite frankly, there is a world of difference between high standards and high expectations. High standards are those externalities that we ask students to meet, i.e., graduation requirements. An expectation is the internal belief that the adults have that the kids can and will meet those higher standards. Expectations are crucial. Frequent Monitoring of Student Progress. In the effective school, pupil progress over the essential objectives are measured frequently, monitored frequently, and the results of those assessments are used to improve the individual student behaviors and performances, as well as to improve the curriculum as a whole. Positive Home-School Relations. In the effective school, parents understand and support the basic mission of the school and are given opportunities to play important roles in helping the school to achieve its mission. 2. Leadership is distributed because we are increasingly thinking about leadership rather than just the leader. The long-held belief in the individual leader, working in isolation, is now waning, as Lambert’s chapter where and when lone leadership works well. Belief in the power of one is giving way to a belief in the power of everyone. 3. Leadership is about providing a sense of direction, of knowing where the school is going. Leaders look ahead to see what is on the horizon and what this means for the school. They are aware of those patterns and trends outside the school which will have implications for the students’ learning needs today and tomorrow. They then work towards developing the people and organization to meet the challenges and to seize the opportunities the perceived changes may have for the students, the staff and the school as a whole. 1. Making learning central to their own work. In other words, leaders find ways to focus on both learning in general and on particular aspects for student learning (e.g. how well certain kinds of subjects or grade levels). Leaders do so as learners themselves and make their learning pubic. 2. Consistently communicating and centrality of student learning. Leaders tell and show others repeatedly that learning and particular aspects or areas or student learning are the shared mission of students, teachers, administrators and the community. 3. Articulating core values that support a focus on powerful, equitable learning leaders express and model values that will support a challenging, appropriate education for all. 4. Paying public attention to efforts to support learning. Leaders take time to observe teaching and other forms of learner support and to interact with teachers and other professionals about their practice. As a successful principal, he or she should be visible, and set high expectations for staff members and students, visit classrooms regularly, direct and monitor the assessment system, be an instructional leader, include staff members in the decision-making process, involve parents, and on and on. Supposedly, if a principal does all these things, he or she will have a high-performing school (Mclaughlin.M. and Talbert. J, 2001). Here are three points illustrate that what he or she should not do as a successful principal. Sometimes, however, it is not what you do but rather what you don't do that will determine how successful you are. 1. Don't Learn the Building Security Code. 2. Don't Say "I Disagree"
School principals are the most important employee in the school level where by their play a role as a leader, administrator and school managers. Principals are the highest officer in the schools, appointed by the Ministry of Education, responsible on what happen in the school and its environment. d) Establish and improve school climate and culture. g) Leadership in teaching and educational research. School as a social institution is a universal phenomenon. It is an agent of perpetuation of culture, tradition, civilization, and nation formation that has existed for many centuries. The society has upheld its importance and necessity, and thus the society has built schools to educate children and youth with the relevant knowledge, skills, beliefs, values, and ideologies in order to make them literate and function well in the process of life and living. In the contemporary situation, school is also an agent of change towards a better quality of education and eventually towards a better quality of life (Sufean, 2006b). Henceforth, school leadership and management has become the crux of schools’ existence and excellence. Apart from that, school have always been observed and criticized in terms of their responsibility, accountability, effectiveness, and standards (Sufean, 2006a). Even though more than 300 empirical investigations have examined leadership (Bass & Stogdill, 1990), leadership continues to be something everyone knows exists, but could not define (Bennis & Nanus, 1985) it properly. The term leadership means different things to people. Yukl (1998) argued that leadership is a ‘word taken from the common vocabulary and incorporated into the technical vocabulary of a scientific description without being precisely redefined’. Therefore leadership implies different meaning to different people and consequently researchers, try to define according to the need of their respective research purposes. 1) Leadership may be defined as a process through with persons or groups intentionally influence others in the development and attainment of group or organizational goals. (Stogdill. R.M,1974:7-162). These definitions and numerous other definitions of leadership appear to have one common assumption, that leadership involves process of influence..According to Yukl (1994) in his review found that the definition of leadership centers on the intentional influence of an individual over other to structure the activities and relationship in a group or organization. It emphasizes providing suitable technical support to plan, organize, coordinate and implement teaching and learning activities in the school. Technical leadership are competitive in manipulating strategies and situations to ensure optimum effectiveness (Sergiovanni, 1984). Instructional leadership is regarded as the important factor in effective schools and there are many different definitions of leadership in literature. Generally, traits, behaviors, roles and processes are critical aspects regarding the leadership. There is an assumption that leadership includes a process where intentional influence is exerted by one person over other people tp organization. According to Hoy & Miskel (2000), leadership is a social process in which a member of a group or organization influences the interpretation of events, the choice of goals or desired outcomes, organization of work activities, individual motivation and abilities, power relations, and shared orientations. Ability theory of leadership, developed by Vande Grift and Houtveen (1999), posits that it is the ability of a school head to initiate school improvement, to create a learning oriented educational climate, and to stimulate teachers in such a way that the latter may exercise their tasks as effectively as possible. At the same time, (Blasé & Blasé, 1999) proposed that school head behaviors of instructional leadership consists of setting high expectation and clear goals for students and teacher performance, monitoring and providing feedback regarding the technical core (teaching and learning) of schools, providing and professional growth for all staff members, and helping create and maintaining a school climate of high academic press. Furthermore, Hoy & Hoy (2003) made a statement the school head must communicate a clear vision on instructional excellence and continuous professional development consistent with the goal of the improvement in teaching and learning. In another word, the instructional leadership construct is defined in terms of school head behaviors that lead a school to educate all students to high student achievement. McEwan (1998) suggests that instructional leadership consists of behaviors which define and communicate goals, monitor and provide feedback on the teaching and learning process, and promote school-wide professional development. Defining and communicating shared goals that focus attention to the technical core of schools. Instructional leaders need to make decisions with goals about teaching and learning in mind. Then, monitoring and providing feedback on the teaching and learning process encompass behaviors that evolve around the academic curriculum. Being visible throughout the school, providing praise and feedback to teachers about classroom and professional growth activities, providing praise and feedback to students about classroom performance or behaviors as well as ensuring uninterrupted instructional time are major activities of instructional leader in school. According to Glickman (2001), instructional leaders monitor the teaching and learning process for the purpose of professional growth for the teacher and administrator, not evaluation. Promoting professional development for all staff evolves activities that encourage life-long learning. Instructional leaders create more opportunities for teachers’ professional development by building workshops or conferences, and providing resources and in-services that cultivate teacher innovation. Defining and communicating shared goals, monitoring and providing feedback on the teaching learning process and promoting school-wide professional development are influenced and stimulated among each other. Moreover, it is demonstrated that these dimensions described above are important behaviors of effective instructional leaders. It is believed that all features of instructional leadership originate from the leadership theory, so leadership theory is important in analyzing leadership behaviors. In the U.S.A., the nature of the school heads’ role has changed significantly in the past two decades, from primarily managerial to that of management and leadership (Lashway, 2002b; Murphy, 2003; Tucker & Codding 2002). There are many challenges in leading school today, especially for the sake of increasing students’ performance, thus leading instructional efforts in a school has evolved into a primary role foe school heads who must focus on teaching and learning----especially in terms of measurable student progress. Research indicates a positive relationship between school leadership and climate; the two factors are related to school effectiveness. An effective school leader is responsible for fostering and sustaining a positive school climate. According to Piltch & Fredericks (2005), effective school head uses knowledge of the social, cultural, leadership, and political dynamics of school community to cultivate a positive learning environment. In creating a positive and safe learning environment, the effective school leader involves the entire school community-students, staff, parents, central office personnel, and community members. A meta-analysis of school leadership research by Marzano et. Al. (2005) suggests that the building of professional relationship between school leaders and staff is a crucial administrative responsibility. In addition, establishing a climate of trust is eddential in promoting organizational chang (Kouzes & Posner, 2002; Tschannen-Moran, 2004). Therefore, in the process of establishing the school climate, high expectations and respect are important. Harris & Lowery (2002) conductes a survey on 123 teachers enrolled in a school head preparation program at a university, and the teachers listed the following school head preparation program at a university, and the teachers listed the following school head behaviors as the most valuable in establishing a positive school climate: respect for students, communication with students as well as support of students. Various reviews of existing research have put forward the conclusion that the influence of school heads on student achievement is indirect in nature (Hallinger & Heck, 1996; Leithwood & Riehl, 2003). However, there is evidence that school heads play a major role in shaping teacher attitudes toward student learning and that school and that school head involvement influences student opportunity to learn (Hallinger et al., 1996). Apart from that, an effective school leader promotes shared leadership in numerous ways. For example, encouraging teachers to serve as staff development trainers, conducting team review of instructional data, and facilitating group decision making regarding students who are not meeting which academic success are all effective way to promote shares leadership (Richard, 2008). Effective school leaders distribute administrative tasks and create multiple leaders within the school (Kouzes & Posner, 2002; Portin et al., 2003; Spillane et al., 2001). Collaborative and ongoing review of school progress, making changes as necessary (“messy leadership”), is preferable to “neat leadership”, in which the process takes precedence over achievement (Reeves, 2006). A review of the literature over the past century reveals that promoting a positive school climate is a critical responsibility of the instructional leader. Positive school climate can influence the outcome of teaching and learning. Human resources administration is considered as the important role of a school head. Hallinger and Heck (1996) found, in their study of the school head’s role in school effectiveness, that the effects of school head leadership are most likely to occur indirectly through the school head’s efforts to influence those who come into direct contact with students in the instructional setting. Interviewing and teacher selection are major responsibilities of the school head. Standardized questions that reflect solid content validation for the practices of effective teachers (Strong, 2002, 2007). Research-based quality indicators as a focus the interviewer on what the teacher interviewee could be expected to say in response to a given question (Strong, 2002, 2007). Effective school heads recognize the teacher leadership within the building and involve teachers in the design and implementation of professional development opportunities (Blasé & blasé, 2001; Cotton, 2003; Drago Severson, 2004). Effective school heads provide the time, resources, and structure for meaningful professional development (Blasé & Blasé, 1999; Drago Steverson, 2004; Ruebling et al., 2004). Effective school heads are aware of the professional literature relates best practice and keep their staff informed as a part of professional development, developing a culture of learning (Blasé & blasé). In the process of providing professional development, effective school heads use collaborative leadership. Marzano et. al. (2005) found in their meta-analysis that high-achieving school heads provide opportunities for staff to give input on all important decisions, use leadership teams in decision making. Thus, selecting, supporting, developing, and keeping the right teachers in school are vital means for success in education. Effective school heads are good at communicating with teachers and students in order to building strong relationships because they value their feedback and ideas they receive. Effective communication can connect a school head to teachers and students that is crucial to meet school goals (Rechard, 2008). School heads need to develop the means for teachers to communicate with each other, be accessible to teachers, and keep the lines of communication open to all staff. Mazano et al (2005) suggests that good communication is crucial to meeting school goals, and it is the foundation to build positive relationships with parents, families as well as larger community. Unfortunately, Richard found that the importance of effective communication can be taken for granted or even neglected. The world outside schools is changing rapidly; consequently, it takes positive, effective, and ongoing communication to meet challenges associated with preparing students to enter this changing world (Richard, 2008). It is believed that the core business of school is learning and teaching, and the mission from beginning to end is about students. So it is imperative that the school bead makes a difference in quality of teaching and learning in school and, ultimately, in the quality of life of students (Richard, 2008). However, from several research works, it is found that school heads influence student achievement by shaping the school’s instructional climate and instructional organization. According to Reed et. al. (2001), school heads in lower performing school are more likely to modify their leadership focus and emphasis on improving test scores. However school heads in higher performing schools seemed to focus on educating the whole child rather than simply concentrating on raising test scores. Then, Lashway (2002a) described important behaviors for developing effective instructional leaders to include making students and adult learning a priority, setting high expectations, and aligning instruction to standards. School heads must know academic content and pedagogical techniques. They must work with teachers to strengthen skills. They must collect, analyze, and use data in ways that fuel excellence. They must rally students, teachers, parents, local health and social service agencies, youth development groups, local business, and other community residents and partners around the common goal of raising student performance. School heads in high-performing school place less pressure on their teachers to perform well on standardized tests, even though high-stakes testing is still a concern. Modifications to the curriculum and teaching practices are more likely to occur in low-performing schools (Reed et al., 2001). High-performing schools focus on using varying types of data such as standardized scores as well as progress monitoring in order to guide school programs and instruction (Snipes et al., 2002; Togneri & Anderson, 2003). In conclusion, effective school heads have certain qualities that influence the teaching and learning in classroom. Instructional leaders are good at improving teaching and learning in terms of the school mission and goals. Hence, a good school head mastering the instructional leadership strategies is important in leading a school to be a high-performing one. Although the research on what makes schools effective has had a direct impact on national reform movements, it has limitations. First, there is disagreement over the definition of an effective school. Researchers use varying descriptions, ranging from "schools with high academic achievement" to schools that foster "personal growth, creativity, and positive self-concept." Although the five factors we have described are helpful, they do not really pro-vide a prescription for developing successful schools. Another problem is that much of the research has been conducted in elementary schools. Although some researchers suggest applicability to secondary and even higher education, caution must he used in carrying the effective-schools findings to higher levels of education. The generalizability of the re-search is also limited, since several of the studies were conducted in inner-city schools and tied closely to the achievement of lower-order skills in math and science. If one wanted to develop a school that nurtures creativity rather than basic skills, another set of characteristics might be more appropriate. Early start. The concept that there is a particular age for children to begin school needs to be rethought. The earlier schools start working with children, the better children do. High-quality programs during the first three years of life include parent training, special screening services, and appropriate learning opportunities for children. While such programs are rare, those that are in operation have significantly raised IQ points and have enhanced language skills. It is estimated that $1 spent in an early intervention program saves school districts $7 in special programs and services later in life. Focus on reading and math. Children not reading at grade level by the end of the first grade face a one-in-eight chance of ever catching up. In math, students who do not master basic concepts find themselves playing catch-up throughout their school years. Effective schools identify and correct such deficiencies early, before student performance deteriorates. Smaller schools. Students in small schools learn more, are more likely to pass their courses, are less prone to resort to violence, and are more likely to attend college than those attending large schools. Disadvantaged students in small schools outperform their peers in larger schools, as achievement differences for the rich and poor are less extreme. Many large schools have responded to these findings by reorganizing themselves into smaller units, into schools within schools. Research suggests that small schools are more effective at every educational level, but they may be most important for older students. Smaller classes. Although the research on class size is less powerful than the research on school size, studies indicate that smaller classes are associated with increased student learning, especially in the earlier grades. Children in classes of fifteen outperform students in classes of twenty-five, even when the larger classes have a teacher's aide present. Increased learning time While not an amazing insight, research tells us what we already suspect: more study results in more learning. Longer school days, longer school years, more efficient use of school time, and more graded homework are all proven methods of enhancing academic learning time and student performance. Assessment. Investing time is useful, but assessing how effectively the time is spent is also important. Testing student performance has been tied to greater achievement, and some districts have gone so far as to pay teachers incentives for improvements in student test scores. Teacher training. Researcher Linda Darling-Hammond reports that the best way to improve school effectiveness is by investing in teacher training. Stronger teacher skills and qualifications lead to greater student learning. Conversely, students pay an academic price when they are taught by unqualified and uncertified teachers. Trust. Trusting relationships among parents, students, principals and teachers is a necessary ingredient to govern, improve, and reform schools. As trust levels increase, so does academic performance. And what about technology? School districts that are hesitant to spend funds on teacher training, class size reductions, or early childhood education programs nevertheless are quick to invest significant sums in computers and upgraded technology. Research says very little about the impact of technology on school effectiveness and student performance. Studies are few, sometimes contradictory, and long-term results are still unknown. It is a sad commentary that the glamour of cyberspace is more persuasive than decades of research. School principal, as leaders, have always had to deal both with their own demands and those of others inside and outside the school building. He is also the single administrative officer that is responsible for the work performance of one or more other people (Lunenburg, 1995). Virtually all effectiveness studies in one way or another, have acknowledged that the school principals as key factor in ensuring school effectiveness, productivity (Bookbinder, 1992) and heading in the right direction. Among his roles are to ensure the effectiveness of his school, improve the teaching and learning climate, upgrade the teachers’ professionalism, and morale, aware of the happenings in the school. Thus, his leadership is an important variable that determine the success or failure of education which includes the academics of student (Hussein Mahmood, 1997). Bobbins and Alvy (1995) suggested that school principal should model lifelong learning. Here it means reading and sharing research with teachers and parents, participating in subordinates’ development session and asking for subordinates’ comments. The school principal himself can gain on the job learning experiences from numerous ways such as workshop class visitation, reflective journal writing, books, educational, journals, conferences and discussions, and visitations to other school principals such ongoing learning is vital for a school principal to gain expertise in leading and managing the school effectively and efficiently. Richard Gorton & Kenneth McIntyre (1970s) in their national study of the principal ship found effective principals have their strongest asset “an ability to work with different kinds of people having various needs interests’ expectations”. They seem to understand people, know how to motivate them and how to deal effectively with their problems. It is primarily this factor, rather than a technical expertise that caused the “significant others” to perceive these principals as accessible and effective administrators. Sergiovanni (1995) believes school principal has the role of ‘human engineer who emphasize human relations and interpersonal competence techniques. As human engineer, school principals provide needed support, encouragement, and growth opportunities for teachers and others. School principals should always support professional growth for their subordinates to cultivate their hidden talents or unseen potentials that will in turn contribute to the school. The recent revamp of the education system to meet the objectives and the development of the secondary education plus the needs of globalization, the k-economy and k-worker, it is the responsibility of the principal to facilitate the change in the school level. Facilitative school principals help to create the necessary conditions for change (Chanley, 1994). However, school principal should realize, as Robbins & Alvy (1995) reminded, when implementing changes, an individual performance often gets worse before it gets better. Therefore, trust between the school principal and his teachers in an essential ingredient in a school change process. Principals should also encourage open communication (Gresso & Robertson, 1992) and welcome conflicting ideas and regard them as valuable sources of information that will enhance the change effort. School principals should realize that individual differences and similarities within the people in the organization will affect the organization performance. If the individual differences are being used to the fullest and complement each other, it will result in synergistic outcomes. Thus synergistic school principals gather strengths of others in problem solving and decision making. This section will be discussing about the method used in the research to analyze the Principals’ Leadership and School Effectiveness in Secondary School. The aspects that will be discussing include research design, data collection and analysis of statistics data. This study was descriptive research of the interview of the interview analysis to identify leadership in school effectiveness condition. There are eight principles (five from the government schools and three from the private secondary school) interviewed by the researchers. To achieve the objective of the study, the survey was conducted using a qualitative approach to obtain the necessary information. It is a multi study by gathering of data to answer the research questions. The objective of quantitative research is to develop and employ mathematical methods, theories, and hypotheses pertaining to phenomena. The process of measurement is central to quantitative research because it provides the fundamental connection between empirical observation and mathematical expression of mathematical relationships. Qualitative is the most appropriate approach for a field of inquiry about which is previously known; and it provides a detailed understanding of the phenomenon under study (Creswell, 2002). The research allows in-depth inquiry into the principals in the high school perspectives on the how the lead or manage the school in order to achieve the vision and mission of the schools. This situation can be concluding it is most appropriate to use qualitative research design. In order to get the information to answer the research question, the researchers choose interview method because it is a form of measurement that is very common in descriptive research. Interview is the most appropriate method to get as much information as possible in a single time. The data was collected through structure interviews with the eight principles, which were identified for the study and through the reading of document to study the way the school presented itself. The interview for each principal took approximately around 30 minutes. Before carried out the interview, appointment made beforehand with the principal so that the principal can take the time to conduct a questionnaire. A set of questionnaire was prepared which include background information of the principal, school background information, school management, school resources and teacher appraisal in order to achieve school effectiveness. The interviewer jotted down the points of the interview when the points mention by the principal were relevant to the research. The principals also acknowledge to the respondents, all the information provided confidentially aspects of the interviews.